miniature DIN, board mount, microphone, DC power, IDC (flat), ribbon, coaxial, video, SCSI, modular, high-temperature and automotive. Single-end hook-up wire leads can be cut, stripped, tinned, terminated, labeled and custom-packaged per the customer’s specifications. 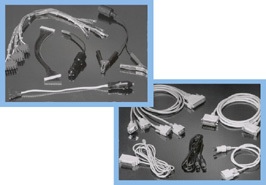 High Tech Connections also provides popular portable cord (SJT, SVT, SPT and HPN), in bulk, for high volume manufacturing demands. For customers who export, we have a broad selection of bulk HAR and VDE-marked cordage acceptable in the global marketplace.